How Can HeinOnline Help You? Looking for a law review article, an old federal statute, or a historical treaty? You can find all of these and considerably more in HeinOnline. HeinOnline is a database that is best known for its collection of law reviews and journals—to access a specific journal, click on the catalog tab above the search bar and enter the name of the journal you’re looking for. 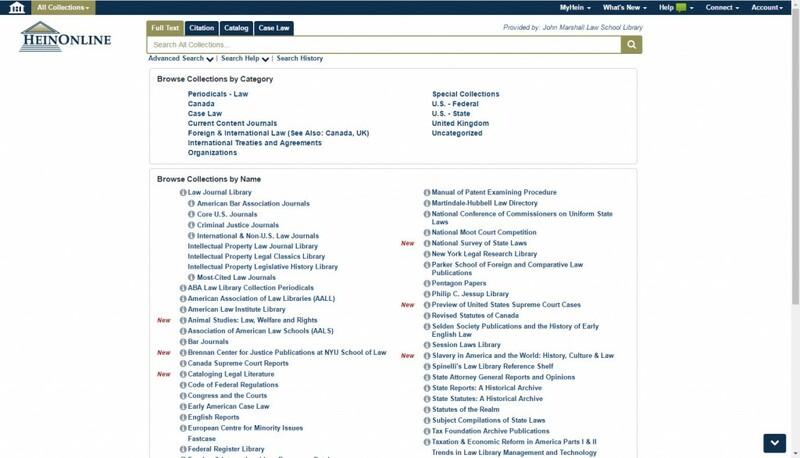 As you can see in the image below, HeinOnline also provides access to a wide range of other primary and secondary legal material, including U.S. federal materials, practice area-specific resources, and cross disciplinary resources on topics such as women and the law and slavery in the U.S.A. and abroad. There is a series of helpful videos on Hein’s YouTube page, and if you have questions about using HeinOnline, please visit the reference desk, call us at 312-427-2737 x729, or send us a message using the “Ask a Librarian” function on the library homepage (available M-Th, 10:00 a.m. – 7:00 p.m. and Saturdays, 10:00-4:00 during the fall and spring semesters). This entry was posted in E-Resources, Featured. Bookmark the permalink. Both comments and trackbacks are currently closed. You are here: Home » E-Resources » How Can HeinOnline Help You?